The precision symmetric step regulator. 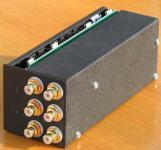 Range 0-63db, step - 1db, fixed input and output impedance. Built-in remote control, digital interface of management, memory of settings on every input, management the associated units. Module of indication of attenuation level.